In early October 1997, I was contacted by H&S Media of Northbrook IL about editing a Virtual Pets magazine for them. After many almost sleepless nights, Virtual Pet Secrets was published. It was on the shelves by Thanksgiving weekend and sold out the quarter of a million copies at $6 each by Christmas. The publishers said if the fad stayed hot, additional issues would be published, but as we all know, it faded and the magazine was not republished. It is no longer available. You may be able to find a copy in a major library. There is a copy in the Library of Congress. The 72 page magazine has hundreds of great photos in it. Two large collectors shared their collections. The Evolution article by Robert Worne is a classic. It is a wonderful article about all the various kinds of virtual pets that came before key chain virtual pets. It is great historical article of the industry. The "Trends and Developments" article is based on the trends article on our site, but all the photos are new. Eiki Satomi is a very interesting Japanese gentleman who webmasters a very popular virtual pet web site in Japan. He shares how he became involved in the industry and provides a view of virtual pets in Japan. The Tamagotchi collector information provides a list of the various versions and colors issued by Bandai. A great product review of the Angelgotchi by a very experienced Japanese Key Chain Pet Collector includes a number of photos of this latest Bandai pet and its accessories. The inside rear cover has an awesome 2 page photo spread of the Hong Kong Commemorative Tamagotchi. 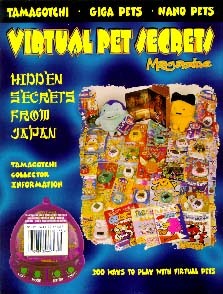 The magazine provides an extensive amount of virtual pet information from many viewpoints (collector, enthusiast, Japan, manufacturer, historical, marketing, and others).